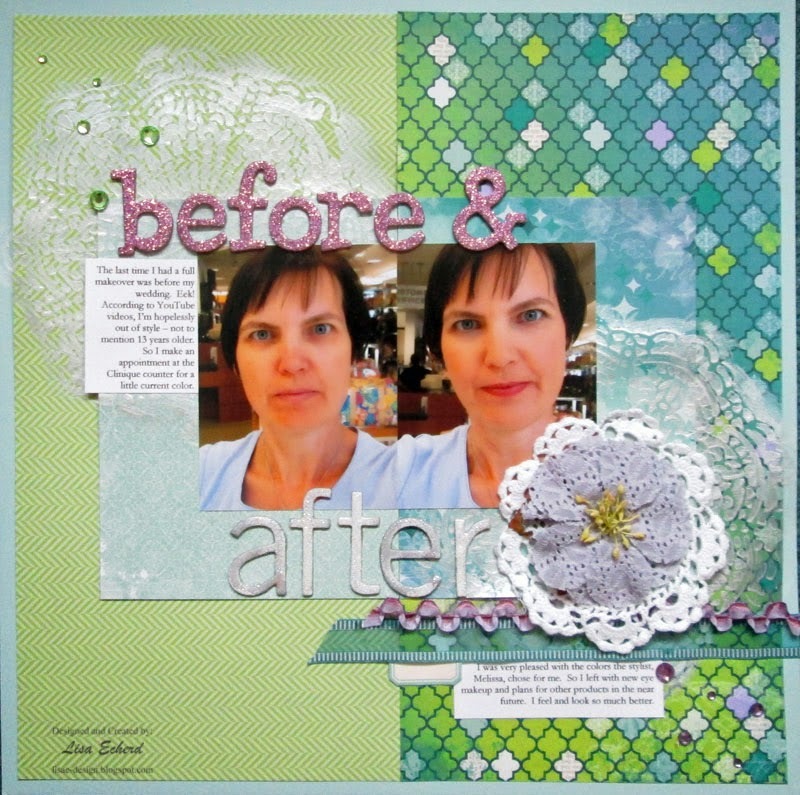 I'm not a kit scrapbooker. I've tried. I subscribed to a kit club a couple of years ago for several months. While I enjoyed working with some embellishments I probably would never have bought on my own, I found many of the items just didn't work with my photos. I'm very photo and story driven when selecting products. Plus I LOVE shopping my stash. However, I sort of stumbled into making up a kit. I had a few products from Bo Bunny and Prima that I bought to go together in lavender, green and blue colors. I've had them a few months and finally matched them up with a photo that has been laying around my scraproom for weeks. Like the perfect couple that just keep missing each other, the photos and papers had never been on my worktable at the same time. They are a good match both in color and style for the photo. Just about that time I was sorting some new photos and found 2 more in need of the elusive lavender colors so I thought I'd just pull some more product to go with what I had and soon had a kit. So this is the first of 3 videos. 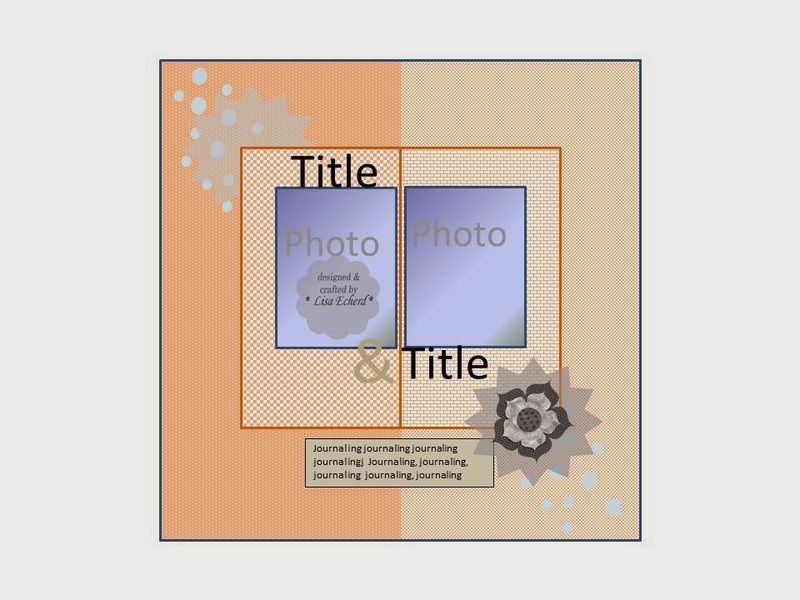 In this one, I show the products for the kit and then create the first page shown above. Next week and soon after I'll have two more pages using this kit. Maybe more, as we took photos on a recent trip that might match up as well. The selfies above were made at the cosmetic counter of a local department store. I hate to admit that it has been at least 10 years since I had a full makeover - (hanging head in embarrassment). I've bought a few things here and there but I knew I was out of style and out of range of my age. Time for an update. So I went back in June and got a new look. I was mostly wanting eye makeup and I love what she did. It doesn't show in this photo but I still can remember the experience. Often my albums are like almanacs so years from now when I'm wondering just how long it has been since I updated my look, I'll know. For the page, I used two different papers from the 6x6 pad and some different background papers to emphasize the contrast in Before and After. It isn't a drastic change but a more 'turning up the color.' I also used a stencil and craft paint. 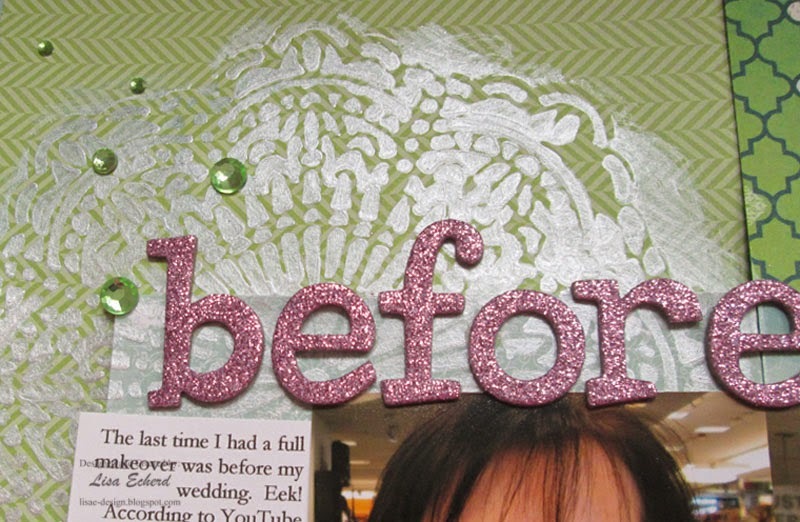 For more on stenciling on your pages, check out my new class - Scrapbooking with Stencils. You can use stencils with lots of supplies you probably already have to add a lovely layer to your pages. 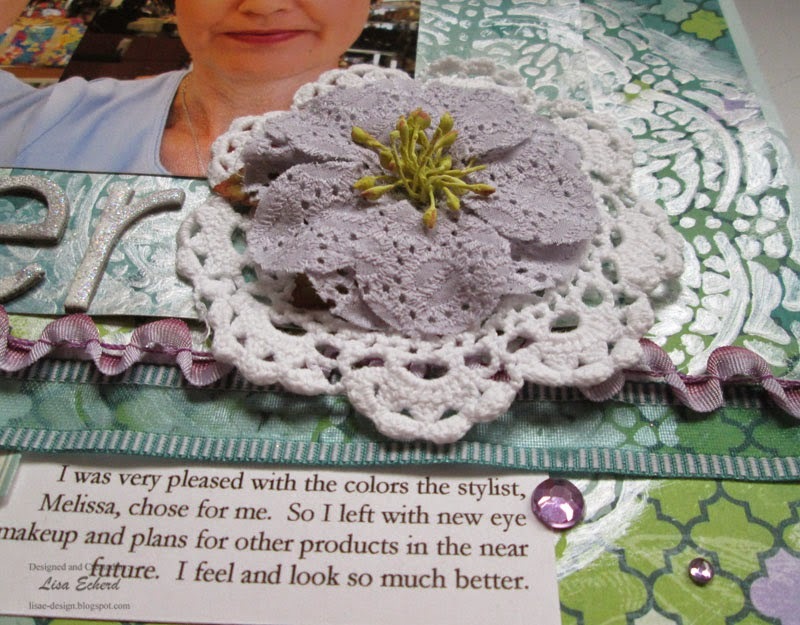 I had this doily in my stash that really plumped up that fabric flower embellishment from Prima. I like my new look when I have it on. I don't wear makeup every day. I'm perfectly fine with trotting out to Walmart in old shorts and a t-shirt and no makeup. I hope to never get ambushed and put on that "What not to wear" show. I really do have nicer clothes and dress for most appointments and other outings. I'm just not too worried about being seen in public without mascara. Such a lovely page, Lisa! I always love to see purple. It's my favorite color, but I rarely seem to use it when I scrap. I love the color combo you chose to go with it. Your layouts are lovely as always. I like the contrast of the paper with the different photos as well. Are we suppose to update our looks…missed that memo, lol. But a lady thought my daughter and I were sisters (I think she may have needed glasses) but I'm okay with that, lol.